Based on the first US credit-bearing college program in Vegetarian Studies (taught by registered dietitian George Eisman at Miami-Dade College), A Guide to Vegan Nutrition is a thorough and authoritative work on vegan nutrition. Drawing on current research, this book covers a variety of topics, including protein, carbohydrates, fiber, lipids, digestion and absorption, vitamins, minerals, how to prevent diet-related diseases, risks and benefits of vegan diets, and descriptions of healthy vegan diets for all stages of life. Each topic is covered in depth, yet this book is concise and the style is readable and straightforward. Also included are illustrations, practice tests, answer keys, an index, and an opportunity for self-paced study leading to a certificate. 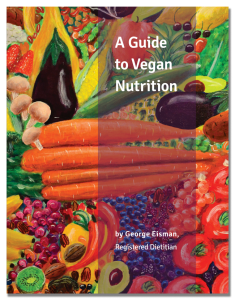 A Guide to Vegan Nutrition is an excellent resource for both long-time vegans and for those who want to transition to a healthy plant-based diet. After reading this book you will be able to answer questions from friends or health professionals who are skeptical about plant-based diets. It has been used as a text for college courses and as a nutrition reference guide by many instructors of vegan food preparation classes. George: I want to order your new book, but I had trouble with the website. No publisher code was passed. We cannot display your products. You can click directly on “paperback” or “ebook” and it should send it to your shopping cart. If you continue to have problems, you can order it on Amazon or call our customer service line at 978-829-2525.